The dishewasher is going. It is nice white noise for my thoughts. I was very hungry when I finished cleaning the kitchen this morning. (That is what pregnancy does to you. You eat and two hours later it feels as if you haven't eaten for nine years.) I opened the refrigerator and scanned the contents. I encountered several unidentified tupperware of which I leave it to my husband to open and discover their treasures. I am not that brave today. I saw last night's dinner which was delicious but my stomach is not a fan of garlic at the moment and the leftovers are garlic enfused pasta. I kept scanning and my patience paid off. There, hidden in the back was my prize. A red ceramic pie pan half full of one of my favorite foods. I took a bite, and was no longer in my kitchen, but was sitting at the table of my grandparents house. I had just finished off a plate of rhubarb pie and a side of ice cream, a staple for any meal at Grandma's. I was 7 and it was summer. Nothing says summer to me like a slice of rhubarb pie. I took the plate to her sink, got a drink of water out of the jug on her counter. This water was room temperature and so delicious. To this day I still don't mind room temperature water. I then went outside to play in Grandpa's little Garden of Eden. I don't remember what I did. Perhaps I climbed trees or ran around or hid in the scary wood closet that was attached to their ramp (the door to come out into the backyard was on the second story, so there had to be a ramp down.) Perhaps I tried to open the door with the old skeleton key and was delighted when it worked. I really can't remember, but I do remember it was bliss. I remember her backyard. Oh how I long for a backyard like hers! She and Grandpa had a huge garden which grew just about every vegetable imaginable. There were pear, apricot, peach, apple and plum trees. There were hazelnut trees lining her front walk. Beneath all the trees in her backyard was a strawberry patch. Her front yard was a virtual Eden. There were so many roses and sunflowers and lilacs. Every time I take a bite of rhubarb pie I am transported back to her house. I can smell the smells of it. I can feel the warmth and see the prisms that were always dancing on her walls. I can see myself sitting in front of her fireplace with a book of fairy tales on my lap (of which she had an abundance). Another bite and I am in my parent's backyard. I am barefoot and dirty. 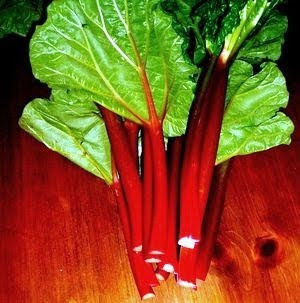 I just picked a piece of rhubarb from our garden and after carefully stripping the leaves from it, take a small nibble from the end. I love the way the tartness shocks my tongue. My mouth instantly salivates from the sourness and my face involuntarily contorts in reaction. Mom is in the kitchen making dinner and the sun shining through the trees is casting a fairy tale glow in my backyard. I remember offering a piece to my friends and they all look at me in disbelief. They have never heard of rhubarb before, and the concept of eating something that made my face contort in such a way is alien to them. There are so many memories in conjunction with this beloved plant. Now that I am grown I am anxious to help my son create such memories for himself. Every person should have a food or a smell that makes them be 7 again. After such a wonderful journey into my memory I have an empty pie plate in front of me, am no longer hungry, and am perfectly happy. Grandma would be so proud that I learned to make her pie. Want some? Go on, try it! It's great! For the recipe go here. Yes, I have these crazy pregnant moments too! Although I usually feel kind of crappy after scarfing down a lot of sugary dessert. But I know what you mean how food can be so nostalgic and filled with great memories! I hope I can create those in the future for my children and grandchildren! Picture Window theme. Theme images by borchee. Powered by Blogger.